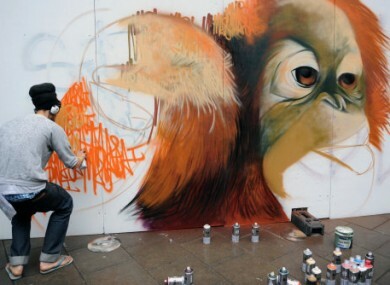 A graffiti artist at work in the See No Evil street art project in Bristol today. A pilot of a Red Arrow stunt planes has died after his jet crashed at an air show in England today. Onlookers in Bournemouth, Dorset watched his plane crash and bounce off the ground during the aeronautic display by the UK Royal Air Force Acrobatic team. Libyan rebels are one step closer to entering Gaddafi-held Tripoli after taking control of a coastal city 30 miles away from the capital. As rebels entered Zawiya, the AP reported that US Assistant Secretary of State Jeffrey Feltman said the best thing Gaddafi could do was to step down. Fianna Fail is outraged that Horse Racing Ireland CEO Brian Kavanagh has been paid the remainder of his backdated bonuses from 2008 and 2009, even though the current Government had directed HRI not to. Fianna Fail, of course, allowed the payment of the major part of those bonuses last year before they left power… This evening, the Government got a guarantee from HRI that the bonuses would be voluntarily repaid to the State. The former partner of one of the two Northern Irish women killed in Turkey on Thursday has said that he is hoping to take the bodies of Marion Graham and Kathy Dinsmore back to Newry within the next few days, according to RTE news. With emigration on so many minds, it’s sad to hear of the closure of The Irish Post, a paper that once kept the Irish community in Britain in touch with news at home. On the positive side is proactive people like Philip O’Connor who wrote for TheJournal.ie today about running a GAA club in Sweden – with a cricket crease running down the middle of the pitch. President Bartlet… sorry, actor Martin Sheen, has ruled himself out of running for the Aras this autumn. He says he’s flattered by the calls for him to run but ‘no thanks’. Politicians: check your automated settings. That would appear to be advice Labour Joe Costello TD will be heeding in future after a response tweeted from his account seemed to ‘snore’ at a citizen who is campaigning against the possible re-introduction of third-level education fees. Costello toldTheJournal.ie that it was an iPhone ‘glitch’ that generated the tweet. It may well be – his phone sent us a similar tweet on August 4. Read our story here. Andrea Corr has been describing how she feels about her striking looks to The Guardian’s ‘What I see in the mirror’ series. We discover that she is “obviously not” the most beautiful woman in the world; doesn’t want Botox or fillers; and thinks she is turning into her late mother. Need a treat for the eyes? Throw your peepers over the Week in Photos. If that doesn’t work, see the world through the eyes of a two-year-old. (Dad strapped a camera to his daughter’s head for a walk in the park – you can see it at 1:49). Cuteness.